The Manistee Newspapers were filled with the news. Stacy had not only won, but he had won big. He was one of only five democrats who would go to Lansing, representing Manistee, Michigan. His star was on the rise! Manistee: November 9, 1906. That Manistee County should return a Democratic member in the State Legislature is or was one of the most unthought-of things in the politics of the present year. In a county normally returning Republican majorities of from 500 to 1,000, Stacy C. Thompson, the Democratic opponent of Frank E. Burke, Republican candidate for Representative in the state legislature, received a plurality of 766, a difference of nearly 1,500 votes being shown between his and James C. McLaughlin’s majorities. The total vote polled in the county was only 3,358. Thompson is an artless campaigner. When he was elected as a delegate to the county conventions the Democratic party – a party in name only and with organization in the county – he went simply as one of the remnants ready to accept defeat as the Socialists seem ready to do, in order to gain a footing. When his name was proposed he wanted to decline the nomination, but in the face of a mere handful of delegates such a course seemed impolitic and in due course of time it was certified with the balance of the county nominees of the Democratic ticket to the county clerk. 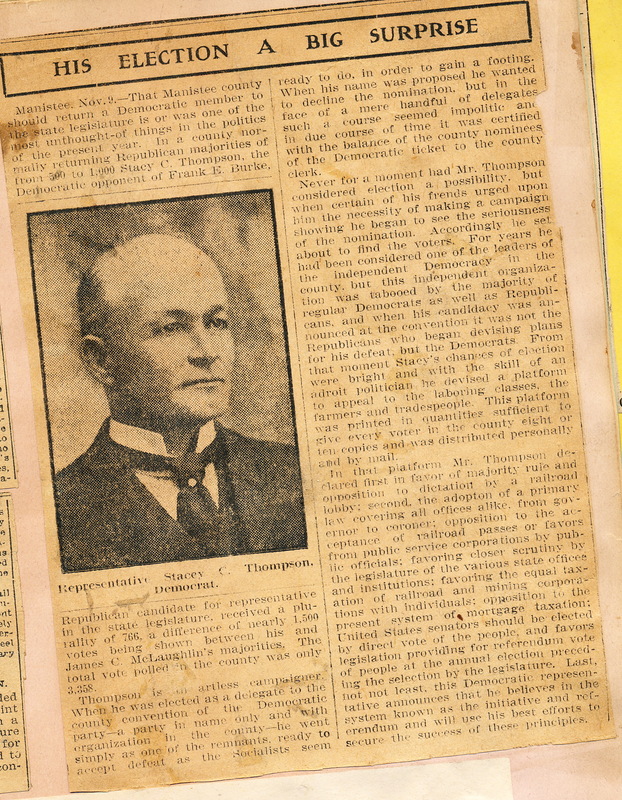 Never for a moment had Mr. Thompson considered election a possibility, but when certain of his friends urged upon him the necessity of making a campaign showing, he began to see the seriousness of the nomination. Accordingly, he set about to find the voters. For years he had been considered one of the leaders of the independent Democracy in the county, but this independent organization was tabooed by the majority of regular Democrats as well as Republicans, and when his candidacy was announced at the convention, it was not the Republicans who began devising plans for his defeat, but the Democrats. From that moment Stacy’s chances of election were bright and with the skill of an adroit politician, he devised a platform to appeal to the laboring classes, the farmers and tradespeople. This platform was printed in quantities sufficient to give every voter in the county eight or ten copies and was distributed personally and by mail. In that Platform, Mr. Thompson declared first in favor of majority rule and opposition to dictation by a railroad lobby; second, the adoption of a primary law covering all offices alike, from governor to coroner; opposition to the acceptance of railroad passes or favors from public service corporations by public officials; favoring closer scrutiny by the legislature by the various state offices and institutions; favoring the equal taxation of railroad and mining corporations with individuals; opposition to the present system of mortgage taxation; United States Senators should be elected by direct vote of the people, and favors legislation providing for referendum vote of people at the annual election preceding the selection by the legislature. Last not least, the Democratic representative announces that he believes in the system known as the inititive and referendum and will use his best efforts to secure the success of these principles. 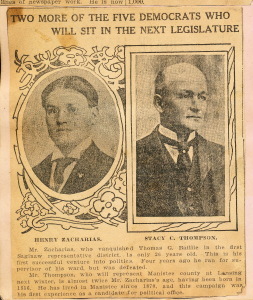 In another newspaper, The Grand Rapids Herald, the news of Stacy’s election filled the front page. 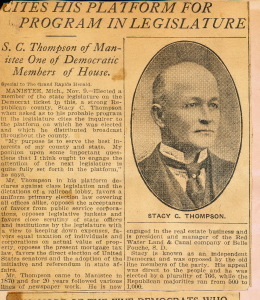 MANISTEE, Mich, Nov. 9 – Elected a member off the state legislature on the Democratic ticket in this a strong Republican county, Stacy C. Thompson when asked as to his probable program in the legislature cites the inquirer to his platform on which he was elected and which he distributed broadcast throughout the county. My purpose is to serve the best interests of my county and state. “My position upon some important questions that I think ought to engage the attention of the next legislature is quite fully set forth in the platform,” he says. 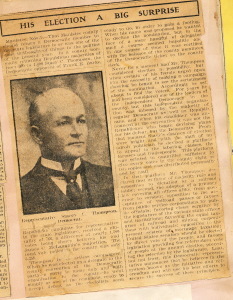 Mr. Thompson, in his platform, declares against class legislation and the dictations of a railroad lobby, favors a uniform primary election law covering all offices alike, opposes the acceptance of favors from public service corporations, opposes legislative junkets, and favors close scrutiny of state offices and institutions by the legislature with a view in keeping down expenses, favors equal taxation of individuals and corporations on actual value of property, opposes the present mortgage tax and favors the direct election of United States senators and the adoption of the initiative and referendum in state affairs. Mr. Thompson came to Manistee in 1870 and for 20 years followed various lines of newspaper work. He is now engaged in the real estate business and is president and manager of the Red Water Land & Canal company of Belle Fouche, S.D. 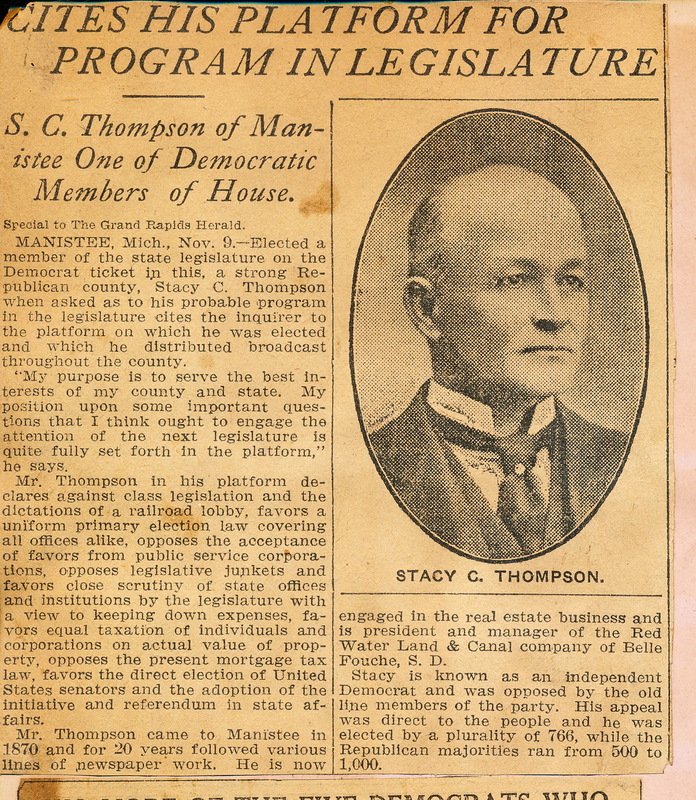 Stacy is known as an independent Democrat and was opposed by the old line members of the party. His appeal was direct to the people and he was elected by a plurality of 766, while the Republican majorities ran from 500 to 1,000. In another newspaper, the headline reads: TWO MORE OF THE FIVE DEMOCRATS WHO WILL SIT IN THE NEXT LEGISLATURE. 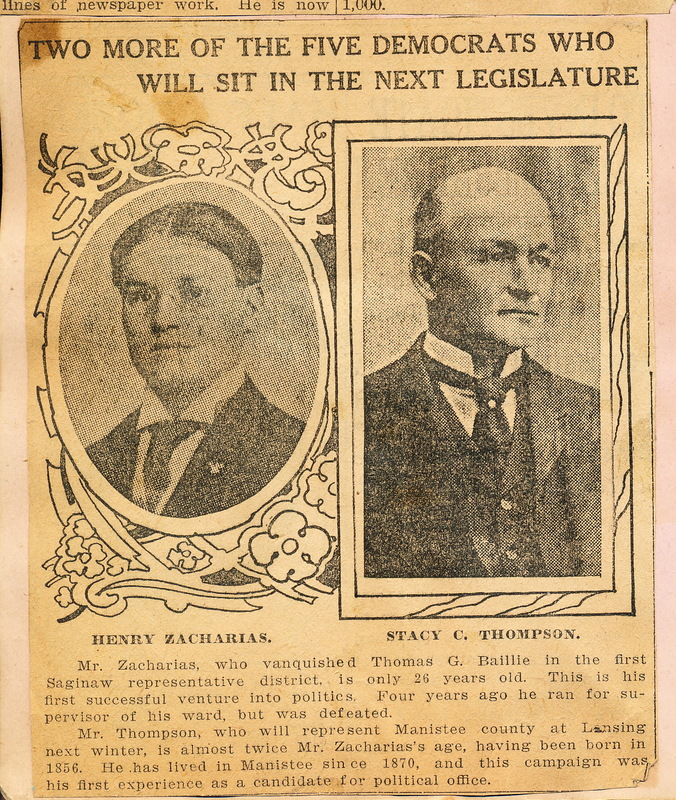 Mr. Zacharias, who vanquished Thomas G. Baille, in the first Saginaw representative district, is only 26 years old. This is his first successful venture into politics. Four years ago he ran for supervisor of his ward, but was defeated. Mr. Thompson, who will represent Manistee county at Lansing next winter, is almost twice Mr. Zacharias’s age, having been born in 1856. He has lived in Manistee since 1870, and his campaign is his first experience as a candidate for political office.